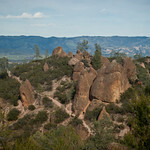 Pinnacles officially became a national park just a month or so ago. Since it’s reasonable driving distance from San Francisco – about two hours – we decided we should take a little day trip. Check out the photos on our Flickr site. We got a ZipCar and took the 280 south (because it’s usually smoother and more scenic than Hwy 101), which turns into 101. After driving through Gilroy, we got off on Route 25. It goes through Hollister, then winds through rolling foothill ranchlands. This time of year is the best in this part of California, when the hills are actually green instead of golden brown. About 30 miles later we arrived at the turnoff for the East Entrance into the park. From there it only takes a few minutes before getting to the Visitor’s Center. 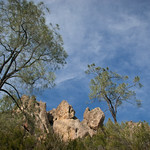 When we arrived at Pinnacles we found that it was fairly busy. The entrance doesn’t have a drive-through kiosk – you have to park and go into the Visitor’s Center to get a pass. We have a National Park Pass, so all we had to do was show them our pass, and get a receipt to stick in our car. All of the trailhead parking lots were full, so we had to leave our car in the parking lot and take the shuttle. We ate a quick lunch and then managed to be the last two people on the shuttle. While on the shuttle, I had a nice chat with my seatmate, who was a spry older gentleman who has been coming to Pinnacles with his family for decades. He and his wife gave me some great advice as to how best to navigate the trails we were considering. The shuttle left us at the Bear Gulch day use area, where there are a number of options for trailheads. We decided to do the Condor Gulch – High Peaks loop trail, clockwise. It’s over five miles, and reasonably strenuous in parts. From the trailhead parking lot, there is a short, flat connector trail before the trail starts a steady but reasonable climb to begin the High Peaks Trail. It was a bit steep in places, but then the trail goes along a ridge for a few tenths of a mile. This was a great place for views of both the eastern and western sides of the park. The trail then becomes fairly steep, with a series of switchbacks leading up to a rest stop of sorts, where there’s a bench and a restroom. We rested for just a bit, admired the views, and then continued along the trail. The trail forks here, leading down to the Juniper Canyon Trail, but we continued up and along the High Peaks Trail. 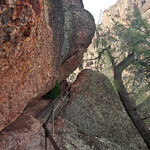 The trail became rockier and steeper, and we started to encounter stair steps carved into the rock. I had been admiring the birds flying around the tops of the rocks, especially a couple of crows flying in pair formations. 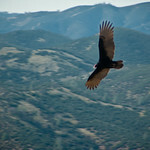 We got to the top of one spot on the trail and stopped for a bit to watch the turkey vultures soaring around. They were really fun to watch. We were on the lookout for condors, knowing that one of the gems of Pinnacles is the growing population of California condors that have been released into the wild. As we continued along the trail, we came across a guy with some serious equipment and a “Pinnacles Condor Crew” T-shirt. We inquired about the condors, and he shared that there had been a bunch of them flying around a couple of hours before, but that they had since dispersed. We were a bit disappointed, but we kept a hopeful eye as we continued along the trail. Then we got to the part of the trail labeled “steep and narrow”. There were more stairs, with non-OSHA-compliant handrails. It’s really hard to describe just how steep and how narrow this carved-out-of-rock trail is… you’ll just have to check it out yourself. We reached another ridge, forked off onto the Condor Gulch Trail, and it was all downhill after that. By “all”, I mean mostly downhill for about 2 miles. it was a relief after so much slow uphill climbing, but on the other hand, our feet got really sore from the pounding! We reached a spot marked “overlook” on the map, which was not only disappointing, but filled with noisy small children. We didn’t linger; we hit the trail, which was a much flatter downhill slope. We were back to the Bear Gulch parking lot a mile later. It’s also just cool. For those of us who can’t get to Colorado or Utah on a regular basis, Pinnacles is a worthy substitute.